A weekly newspaper has celebrated a local football team’s promotion to its highest-ever level in the sport. 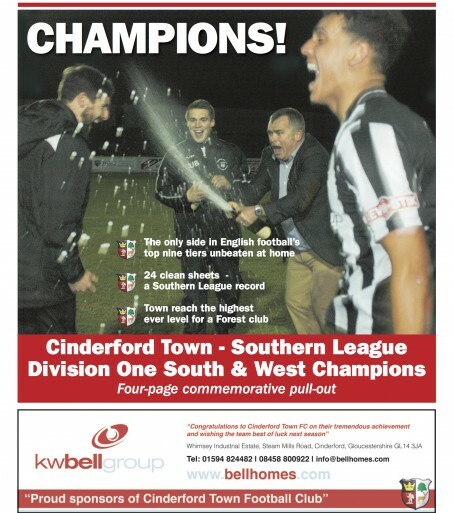 The Forester, which covers the Forest of Dean, Gloucestershire, ran a four-page pull-out marking Cinderford Town’s triumph in the Southern League Division One South & West. Town’s promotion as the division’s champions means they will play in the Southern League Premier Division, in the seventh tier of English football, next season – a level no team from the Forest of Dean has ever reached before. The pull-out, front cover pictured below, includes interviews with manager John Brough, a former professional with Cheltenham Town and Hereford United, as well as with players and the club’s chairman. Forester sports reporter Liam Ryder said: “This is a huge achievement for the club and for the Forest of Dean. “Town have played some fantastic football this season, and won the league with a game to spare despite a horrendous fixture pile-up towards the end of the season that saw them play two games a week since the start of March. “John Brough’s team have been thoroughly entertaining to watch and deserve all the plaudits thrown their way.